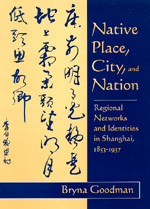 This book explores the role of native place associations in the development of modern Chinese urban society and the role of native-place identity in the development of urban nationalism. From the late nineteenth to the early twentieth century, sojourners from other provinces dominated the population of Shanghai and other expanding commercial Chinese cities. These immigrants formed native place associations beginning in the imperial period and persisting into the mid-twentieth century. Goodman examines the modernization of these associations and argues that under weak urban government, native place sentiment and organization flourished and had a profound effect on city life, social order and urban and national identity. Bryna Goodman is Associate Professor of Modern Chinese History at the University of Oregon.